Commence Fire has complied with the NEW State Law as it relates to Concealed Handgun Training. The Law says it only has to be 8 hours. Our training will be 9 hours! We simply CANNOT give the training we do in 8 hours. 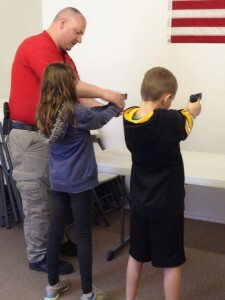 We are going to include training on CHL Law and the Use of Deadly Force. Please checkout out Concealed Handgun License page for more details. Commence Fire Training Academy specializes in Ohio Concealed Handgun License Training and offers a wide variety of other courses. It doesn’t matter if you are a beginner or an expert, CFTA courses are thorough. Our instructors hold OPOTA and/or NRA certifications and are held to rigorous training standards to ensure their proficiency. Be prepared before you choose. Our confidence is in our performance. Call, click or visit us to see for yourself. Are you prepared to defend your life and the life of your loved ones? The decision to purchase a gun to defend your home, yourself and your loved ones is an important and serious one. Only you can make the decision that is right for you. Educate yourself and make an informed decision. What do I need to know before buying my firearm? How do I purchase the right firearm for me? How do store my firearm properly? How do I handle a firearm safely? These are just a few of the questions you want to answer as you make the decision to own a firearm for personal defense. Commence Firearms Training Academy can help you answer these questions. Browse our courses above and don’t let fear stop you from making this critical choice.